Book Stand (Marble) Dimension : W-9 x H-9 Inches Approx. 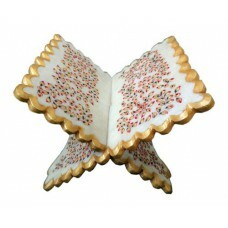 Foldable Rehal (book stand) in Marble ..
Dimension : W-9 x H-9 Inches Approx. Foldable Rehal (book stand) in Marble to keep the scripture/ religious/ prayer book with divine’s elegance. Beautified with masterstrokes of Kishangarh Art (embossed painting) in auspicious golden, red & green colour. Perfect for regular use and for gifting your near & dear ones.